My Fn brightness suddenly stopped working on my Thinkpad T510. I traced the problem back to the Nvidia section of my xorg.conf file. After the following small edit, the brightness keys worked again. PowerPoint makes it easy to produce professional looking graphics quickly. Sometimes I need to export high quality versions of those slides. By default, PowerPoint limits exports to a resolution of 96 DPI (by comparison, many printers use 300 DPI). However, it is possible to change the default DPI by creating a registry entry. And create a new DWORD value called ExportBitmapResolution. Finally set the value to the DPI you want, e.g., 300. Now you can export high quality slides by saving them as images. 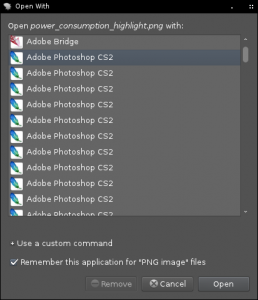 Why are there 20 copies of Photoshop?! 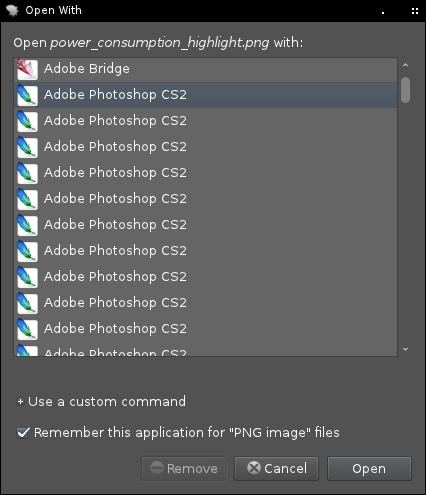 Sometimes duplicate copies of the same program seem to mysteriously show up in the “Open With” dialog. 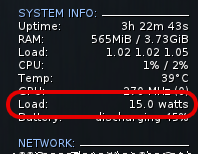 The problem seems to be worse for Windows programs installed with Wine. The reason there are so many duplicate entries in the “Open With” dialog is due to the way file associates are handled in Wine. Every time a new program is installed in Windows, it has the opportunity to register itself as the handler program for a particular file type. This behavior is also present in Wine. Each file handler is stored as a .desktop file in ~/.local/share/applications. Sometimes though, Wine will create a new entry for each and every file type associated with a program. Take MS Excel for example, I have a distinct entry for .xls, .xlsx, .xlsm, .xltm, and .xlsb. These are just for Microsoft’s own variants of their Excel spreadsheet format and each one creates a new entry in the Open With dialog! At this point, there are two options. 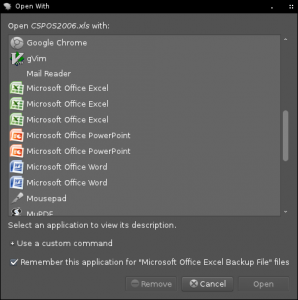 Try to combine several entries together by allowing each one to handle several file types. This is accomplished by editing the “MimeType=” line in the .desktop file. The general format is “MimeType=catagory1/type1; catagory2/type2;” where “catagory1/type1” is something like “text/csv”. The above method seemed like too much work, so I opted for the second choice. Copy all the file type entries that you don’t need to another directory. I moved all but the essential entires to ~/.local/share/applications-old. After a little cleaning up my “Open With” dialog looks much better. 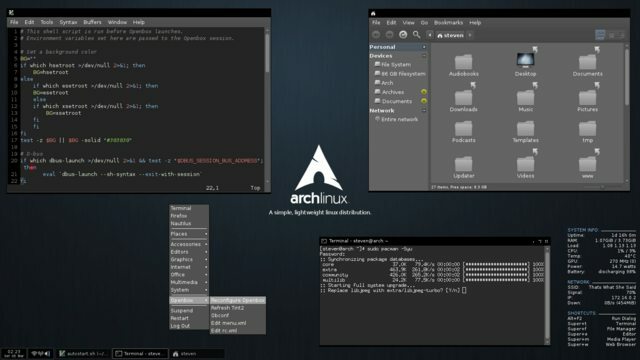 OpenBox is a minimalistic desktop window manager which can be run with or instead of Gnome or KDE. 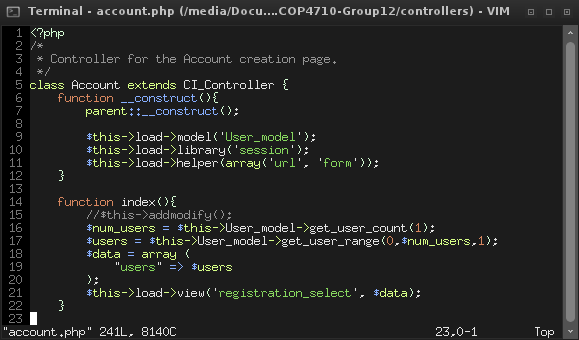 The whole environment is very customizable with nearly everything being controlled by a few scripts and XML documents. 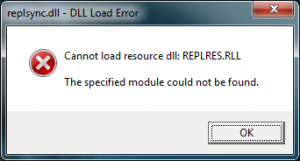 Shortly after installing Visual Studio 2010 I started getting a DLL Load Error message informing me that replsync.dll “Cannot not load resource dll: REPLRES.RLL”. The error message seems to pop up whenever I loose or regain my internet connection. The usual Google search didn’t really turn up any thing. I reinstalled Visual Studio, but the error message came back as soon as I restarted. The replsync.dll file seems to be associated with SQL Server. In my case it’s located in “C:Program FilesMicrosoft SQL Server100COM”. My solution was to rename “replsync.dll” to “replsync.bak.dll”. Perhaps heavy-handed but the message is gone and I can work in peace once again. It’s been two days and I haven’t noticed any ill effects. My laptop recently died and I had to buy a new one. Since I ended up with an extra hard drive, I decided to use the space to install a KDE distro, as I’ve used Gnome pretty much exclusively. I ended up picking kubuntu 10.10 to try. The installation was smooth and polished as expected from Ubuntu, however, shortly after logging in, I was suddenly logged out and sent back to the KDE login screen. This happened a few more times before I realized that X server was restarting. Some additional trial-and-error lead me to the problem: X server was restarting every time I pressed Shift + Backspace. I’ve head of CTRL + ALT + Backspace restarting X, but Shift + Backspace was new and all too easy to trigger by accident.